Need to find a tradesman or service provider in your area? Look no further than Tradesman-On-Call! Our website is your one-stop-shop for plumbers, electricians, IT technicians and even florists. Simply search for the type of service provider you need, leave your details and they will contact you – it’s that simple. Use of our website to find the right tradesman for the job is absolutely free. Our rating system allows you to see how others found the tradesman’s services, giving you peace of mind. Don’t get stuck with a problem you can’t fix, find a tradesman in your area today! 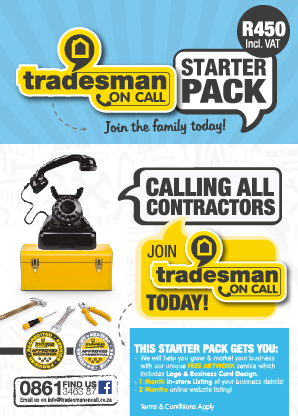 Sign up with Tradesman-On-Call and we’ll help you advertise your business. Sign up, starting from only R200 per month, and gain access to a variety of marketing tools and business services to keep your business up-to-date with industry changes and trends, whilst generating leads for you to grow your business. Reward yourself for getting ahead! Tradesman-On-Call was established for one reason – to help businesses succeed by connecting them with potential clients in their area. To do this, we let our loyal members earn as they shop. Tradesman-On-Call Packs are tailored to meet your needs and give you access to a range of services that will help you ensure your business’ success. PLUS you earn loyalty points, which can be used on advertising to boost your business even more! Please log in or register to use your starter or topup pack. The Tradesman-On-Call Loyalty Card is a rewards programme that allows you to get back a portion of the money you spent. Every time you visit your favourite Mica Hardware or DIY Depot, you earn 2.5% CashBack Rewards in your pocket and have an unlimited amount of swipes, redeemable at any time when paying at the till at any of the participating Mica Hardware and DIY Depot Stores. 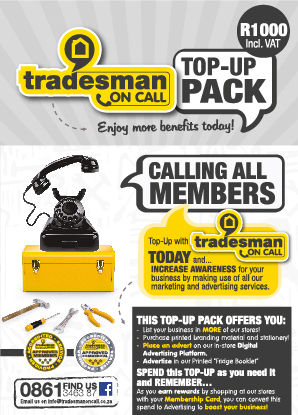 You can also use your CashBack Rewards to pay for your membership with Tradesman-On-Call. Start earning your CashBack today! CLICK HERE or the image of the card to find the participating Mica Hardware stores as well as a list of our partners.